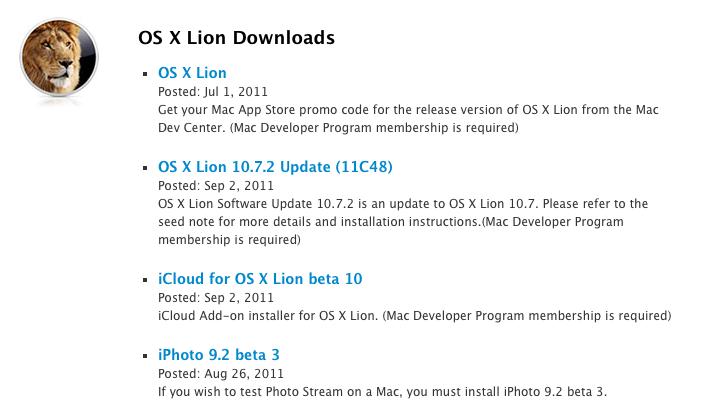 Apple has today released a seed of OS X Lion 10.7.2 to developers. It has also released an update to iCloud for Mac, beta software that allows developers to test iCloud integration with Mac and iOS apps. The downloads are available on Apple’s Developer Site. The new Lion update, which is build number 11c48, is a pre-release version of OS X Lion 10.7.2 provided solely for the purpose of testing iCloud features and is not an official update build. If you’ve installed any previous versions of 10.7.2, you have to revert back to 10.7 using the supplied tool before you update. The last update to OS X Lion and iCloud for Mac came a week ago, although that release also included an iPhoto update, while this one does not. This update provided solely for the purpose of testing iCloud features and is not an official update build. If you’ve installed any previous versions of 10.7.2, you have to revert back to 10.7 using the supplied tool before you update. The iCloud update is beta 9 and is primarily being used by developers to test the syncing features of iCloud. iPhoto beta 3 is also aimed at those testing Photo Stream and other iCloud features.